Our Schools Now • Organizers reduce amount requested from $865M to $700M. Francisco Kjolseth | Tribune file photo Using school desks as props, and surrounded by teachers of the year and Alpine School District students, Our Schools Now formally launch its tax increase initiative on June 6, 2017. Organizers announced Monday they were lowering the ballot initiative's tax numbers, to match a hope-for revenue goal of raising $700 million yearly for Utah's public schools. 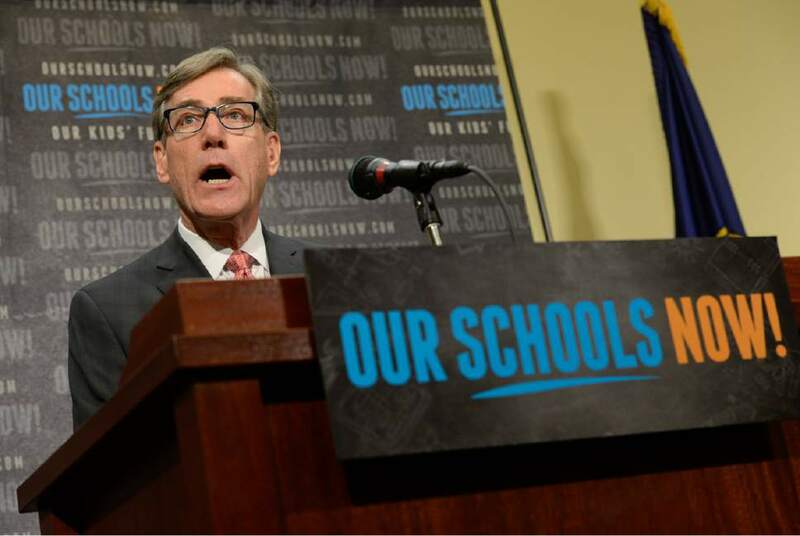 Francisco Kjolseth | Tribune file photo Scott Anderson, President and CEO of Zions Bank speaks in support of Our Schools Now as they formally launch its tax increase initiative during a press event at the Capitol on Tuesday, June 6, 2017. 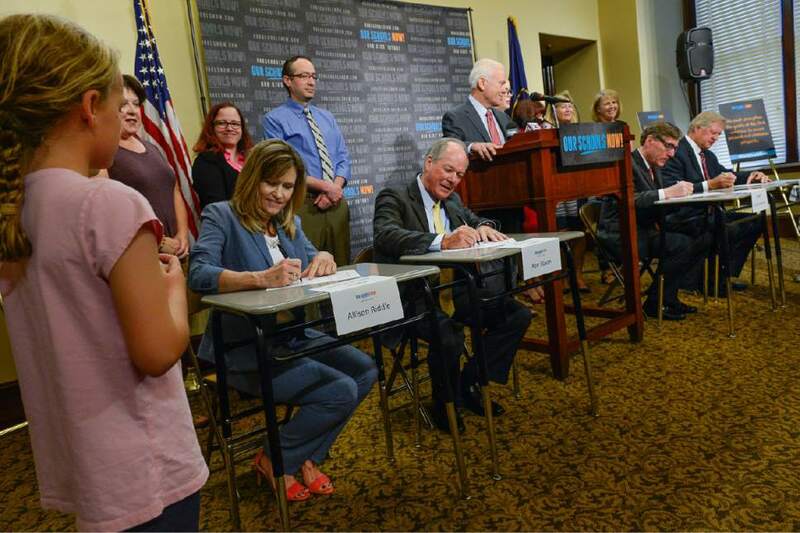 Organizers announced Monday they were lowering the ballot initiative's tax numbers, to match a hope-for revenue goal of raising $700 million yearly for Utah's public schools. Francisco Kjolseth | Tribune file photo Bob Marquardt, chairman of Our Schools Now, speaks with reporters after a formal launch of its tax-increase initiative at the Capitol on Tuesday, June 6, 2017. Organizers announced Monday they were lowering the ballot initiative's tax numbers, to match a hope-for revenue goal of raising $700 million yearly for Utah's public schools. 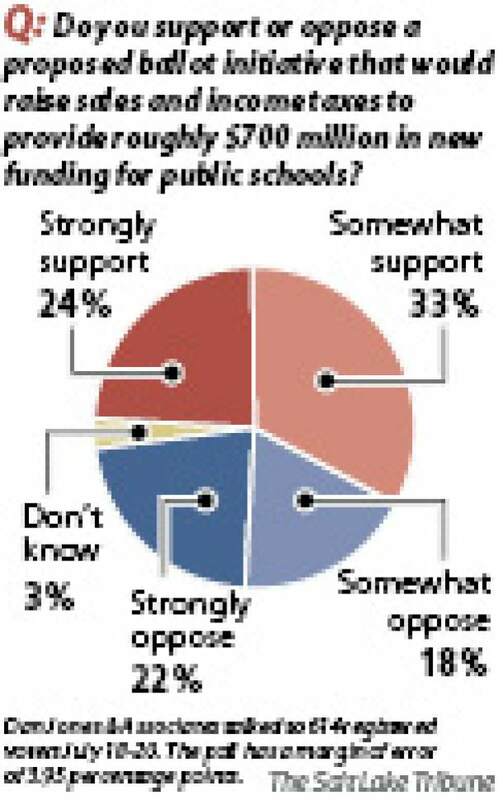 Backers of a proposed ballot initiative to raise more money for Utah public schools have reduced the amount of extra taxes they want voters to approve next year. Our Schools Now organizers announced Monday that the initiative&apos;s Teacher and Student Success Act has been amended to call for income and sales tax hikes of 0.45 percentage points, down from an earlier proposal of 0.5-point increases. The change follows 14 regional meetings hosted by the initiative in July and a cost analysis by the Governor&apos;s Office of Management and Budget that labeled the campaign with a $865 million price tag. That number differed significantly from Our Schools Now&apos;s internal estimate of a $700 million to public education. "Utahns are ready to increase their investment in students and teachers," campaign manager Austin Cox said in a statement. "Our Schools Now gives them an opportunity to do so." A recent Salt Lake Tribune-Hinckley Institute of Politics poll found that a majority  57 percent  of Utah voters support the initiative. If enacted, the initiative would increase Utah&apos;s income tax from 5 percent to 5.45 percent and sales tax from 4.7 percent to 5.15 percent over a period of three years. Campaign committee member Bob Marquardt told The Salt Lake Tribune last week that the changes were being considered to mitigate the discrepancy between the budget office&apos;s estimate and Our Schools Now&apos;s $700 million target. "It&apos;s confusing," Marquardt said of the calculations that produced the $865 million figure. "We&apos;re not really looking forward to starting the campaign on a confusing note." Our Schools Now plans to begin gathering signatures in mid-August. To qualify for the ballot, organizers must secure more than 113,000 signatures from registered voters in at least 26 of Utah&apos;s 29 Senate districts. The new, smaller tax increases are still estimated by the campaign to generate roughly $700 million annually, or an additional $1,000 for each public school student in Utah. 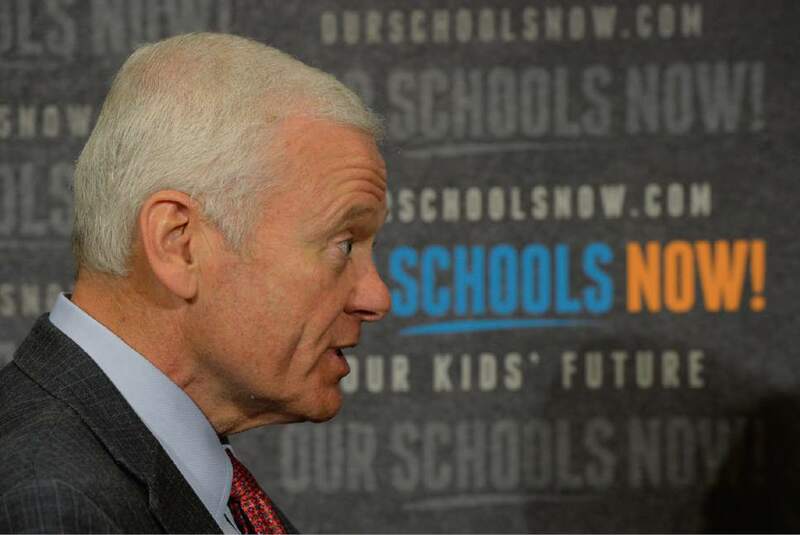 "It&apos;s time to increase our investment in Utah classrooms so that we can improve student achievement in Utah," campaign co-chair Gail Miller said in a prepared statement. "We are more confident than ever Our Schools Now will be successful in next year&apos;s elections."